[The Aydınlık introduction:] Şafak Terzi interviewed CFR member Daniel Pipes, the founder and president of the Middle East Forum. Pipes works on the foreign policy of the United States, on the Middle East, and on the history of Islam and Islamism. The Boston Globe said of him, "If Pipes's admonitions had been heeded, there might never have been a 9/11." Aydınlık: In our previous interview (in March) you said that Washington sees Turkey's Prime Minister Recep Tayyip Erdoğan as a problem rather than a solution: is this still the case? 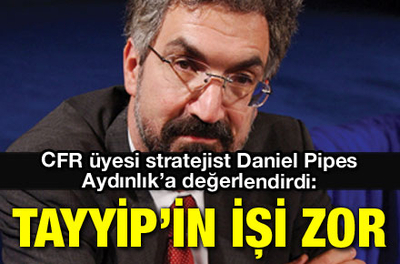 Daniel Pipes: Only since Gezi Park has the Executive Branch realized that Erdoğan is a problem for the United States. That awareness has increased since then, especially following his lenient position vis-à-vis the Islamic State in Iraq and Syria (ISIS) and his sounding like a Nazi vis-à-vis Israel. Aydınlık: How will Washington deal with Erdoğan as a president in two weeks? Pipes: Unless Erdoğan dramatically reverses course, I expect relations will continue to cool. Aydınlık: Washington and Erdoğan had a very good partnership since 2002. What happened? Pipes: Until the elections of 2011, Erdoğan was quite cautious, so outsiders had to know his Islamist background in detail to understand him; since then, everyone can readily see who he is. Aydınlık: Would Washington be more satisfied if his rival candidates for the presidency, Ekmeleddin Ihsanoğlu (CHP and MHP) or Selahattin Demirtaş (HDP), were to become president? 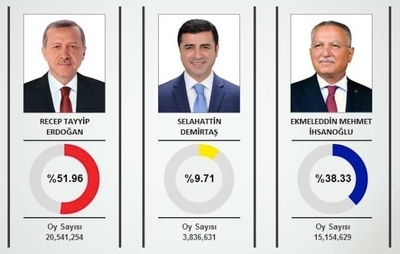 Aydınlık: Looking at the election results, do you think this is more a win for Erdoğan or a defeat for Ihsanoğlu and Demirtaş? Pipes: It is a win for Erdoğan, not a loss for the others, who realistically could not have expected to be elected president. But it is an ugly win because Erdoğan used the tactics of what we in American English call a "tin-pot dictator." I am referring to his absurd three goals in a soccer match, the jailing of journalists and police, the biased TRT coverage, the ethnic insults, the treatment of many citizens as enemies, and much more. This was not remotely a fair election. The percentages indicate voting results. The numbers at the bottom are the total votes for each candidate. Aydınlık: What about the many people who boycotted or protested the elections? Pipes: They have my sympathy. The main choice was between two types of Islamist candidates, Erdoğan and Ihsanoğlu, an Atatürkist nightmare. Aydınlık: How do you evaluate Turkey's general future with Erdoğan as president? Pipes: I am very pessimistic. I see increasing divisions along ethnic, political, and religious lines, with perhaps even more lines of tension yet to come; a grim economic outlook because interest rates have risen and direct foreign investment has dried up; and a failed foreign policy in which "zero problems with neighbors" caused many new problems, especially with Iran, Iraq, Syria, Israel, and Egypt. Aydınlık: Do you expect that Erdoğan will create a presidential system such as exists in the United States? Pipes: No. The American system has evolved out of a deep respect for the rule of law and for the separation of the powers among the executive, legislative and judiciary branches of government. Unless Erdoğan surprises us all, he is planning to rule like an elected padishah who can do whatever he wishes, without rules or limits. Aydınlık: In our last interview, you stated that Erdoğan was not as strong, especially after the Gezi movement, as he was in earlier years. Do you think he will lose even more ground when he becomes president? Pipes: The great unknown at this point is his successor as prime minister. If he finds exactly the right person who is a serious politician but who defers to Erdoğan on important matters, and who can win enough seats in the next parliamentary election to create a presidential system, then the new president has no serious political problems. But if his successor makes mistakes or defies Erdoğan's wishes, he could find himself frustrated and lonely in the Çankaya Köşkü (the presidential palace in Ankara). The presidential palace in Ankara, Çankaya Köşkü. Aydınlık: If the current president, Abdullah Gül, tries to gain power within the AKP, do you think Erdoğan will lose control in the party and Gül will take over the leadership? Pipes: I don't know enough about internal AKP developments to answer, but Gül – who already served as prime minister for four months in 2002-03 – is clearly a potential prime minister. Put differently, the presidential election was boringly predictable but what comes next – the selection of a prime minister – holds great drama. Aydınlık: Would Washington prefer to cooperate with Gül than Erdoğan? Pipes: Just about every single foreign government would rather deal with Gül than Erdoğan, with the possible exception of Putin's Russia. Aydınlık: Erdoğan said he would destroy the so-called parallel structure in Turkey. And recently he arrested some Gülen-linked policemen. Is there really a parallel structure? Pipes: I dislike the term "parallel structure" to describe the Hizmet movement of Fethullah Gülen; I prefer "Gülen conspiracy," because a unique network of mutually cooperating elements does exist. Aydınlık: Do you think Erdoğan is trying to destroy this structure? Pipes: Yes, he cooperated with it until together they neutralized the military in mid-2011. At that point, a political war began that will end only when either Erdoğan destroys Gülen, or the reverse. Aydınlık: Gülen is living in Pennsylvania and is said to be in close relationships with the US. Isn't Washington concerned about Erdoğan's actions against Gülen? Pipes: As someone who also lives in Pennsylvania and who talks to people in the U.S. government, I am unaware of any such close relationships. 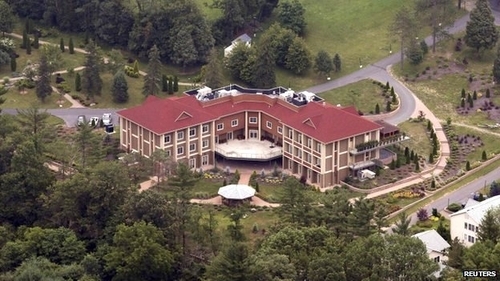 Fethullah Gülen lives in the Golden Generation Worship and Retreat Center in Saylorsburg, Pennsylvania. Aydınlık: Why does the US attack a force fighting the enemies of Washington – such as Maliki in Iraq and Assad in Syria? Recall that, at the beginning of the Libyan and Syrian conflicts, the US supported some opposition and jihadist groups. Pipes: First, I don't think Maliki is seen as a U.S. enemy – not yet, anyway. He is seen as a failed politician who should leave the prime ministry. To your main question: Although ISIS fights the Assad regime, it also fights the other enemies of Assad, it massacres Yazidis, Christians, and Shi'ites, it has opened a dam to flood its enemies, and it threatens to take over the United States. It is clearly an American enemy. Aydınlık: Is the US really conducting military operations against the ISIS? Pipes: Yes, on a small scale. Aydınlık: What are the aims of these operations? Pipes: Good question. The Obama administration has not explained its military goals in Iraq. Destroy ISIS, stop the massacres, extend Baghdad's control to the whole country? Perhaps we will eventually learn the answer. Aydınlık: ISIS has been committing assaults all over the region, so why didn't Washington attack ISIS before? Why now? Pipes: The sight of people dying of hunger and thirst on a mountaintop for the sole sin of not being Sunni Muslims pushed the administration into action. Aydınlık: In a tweet, you stated that groups like ISIS should not be considered terrorist groups but are more like states and militias. Is this because of its changing orientation or because of the strategy of the supporting states? Pipes: Because of its methods. Terrorism consists of sporadic attacks; in contrast, ISIS is conquering territory. It already rules an area about the size of Great Britain. To call that terrorism makes this term nearly meaningless.